We've included listings for companies such as Signature Hardware and Hooks and Lattice Window Boxes inside our Hooks guide. Stock and custom designs and sizes of windox boxes made of wood, wrought iron, copper and fiberglass. Manufacturing and direct sales of old-fashioned push-button light switches. Also: brass switchplates, old-style lightbulbs, and Victorian picture-hanging tassels. A blacksmith shop operated by Nick Vincent, Nathan's Forge produces reproduction ironwork and modern forgings. Of particular interest is the Chesapeake Bay collection, featuring forged iron capturing nature around the Chesapeake Bay. Located near Pueblo, CO, this blacksmith shop offers handmade iron hardware. Here's a source of a diverse line of quality, hand-forged iron hardware for doors, shutters, cabinetry and such. The company offers hard-to-find items like fireplace cranes, upper barn door stays, pintles, and even hand-made nails. Elmer specializes in the making of hand forged tools -- as he puts it, "high quality and finely finished tools as they were made by blacksmiths before the industrial revolution churned everything out from factories." He crafts dividers, calipers, early locks, kitchen utensils and broilers, plus "new old tools" that can be used today - adzes, hammers, billhooks and froes to name a few. This New York company has been in the business of manufacturing decorative hardware and industrial components since 1919. 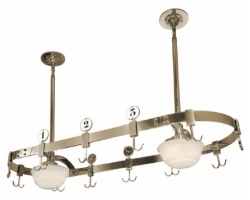 Standard products include door knobs, towel bar fittings, robe hooks, and drawer pulls. Additionally, the company gladly accepts custom orders. 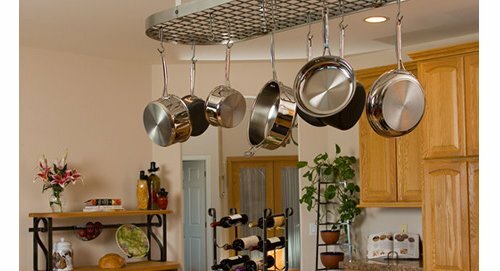 Ceiling-mounted pot racks quickly and easily increase kitchen storage space. Form and function hang together in this elegant pot rack.